Being an eminent Manufacturer, Exporter and Supplier of Forged Steel Valves, we are offering top quality Forged Steel Check Valve to our valuable clients. Our Forged Steel Check Valve has a well guided piston type disc assuring accurate return to seat-ring to achieve leak tightness (horizontal type). Also, there is spring loaded disc on check valves suitable for non –horizontal application in our Forged Steel Check Valve. 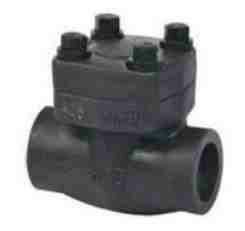 Moreover, we specialize in offering Forged Steel Check Valve in full bore design if required.